Missionaries of the different denominations were early on the field, trailing through the wilderness over bush roads, to minister to the spiritual needs of the settlers. Their first church was a log building erected in 1852 on land donated by Bryan O'Donnell. In 1870, the Kenilworth Church was pronounced unfit and the parish was divided, half being attached to Mount Forest and half to Arthur. The cornerstone for the existing parish was laid in June 1903. Brick was hauled with teams and sleighs from Ballinafad. Bishop Dowling blessed the new church on December 6, 1903. Ringing of the bell had been discontinued in 1960 due to vibration of the Tower. In October 1980, the bell began ringing again to welcome residents to Mass, weddings and special events. 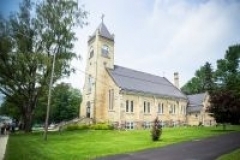 With a large congregation of willing volunteers, many renovations have been accomplished to enhance the building which is fully accessible with a chair lift and an updated basement used for many community gatherings, most noteworthy is the annual Garden Party held on Civic Holiday weekend.